Thoughts on this as a concept, or feedback from other experiences of lightweight tamps? I expect most of us who've used plastic tamps have had a negative experience, but probably because they were rubbish supplied with an entry-level domestic machine. This one has stainless base and bears the pergman design. I was tempted to order one to try it out. But was surprised that it was 58.4mm rather than 58.5mm diameter? Matt Perger uses VST baskets I believe and 58.4mm is what he's worked out is a perfect fit for them. I was confused since the "PergTamp" was 58.5mm. Good point, so it was. I just checked out the new acetal one and it looks intriguing. It says it's been designed for use with VST baskets so I'm guessing they've worked out that 58.4mm is optimal. For $50 I might just have to get me one. herzog, matth3wh and LeroyC like this. Just wondering if any of you guys have received the new tamp. Waiting very patiently to test. Mine arrived last Monday, so almost a week of use now... So far, it's a tamp. It tamps. I do like the handle shape and feel, the lightness still trips me out mentally a little. On reflection, though, for those of us with toddlers, this tamp design is WAY less likely to break a tiny foot, or crack a floor tile when it's dropped by a youngster, so that's a plus!! Wasn't it about dented VST baskets? It makes sense I guess although I'm not sure what you would need to do to dent a basket unless in a commercial environment. Exactly. All the Barista Hustle stuff is designed for the commercial environment. Easily and cheaply replace dented bases. Designed for VST baskets. Fits snugly enough. Lighter and easier to use. Double flange design to stop suction and gives a guide to depth. Hard not to like it. Red tamper beside it no longer in use. AlastairMcG, LeroyC and Baref00t like this. It feels weird at first being lighter, but it tamps well. I probably prefer the overall feel of my Cafelat tamper but the feel is still good on the perger tamper once getting use to the lighter feel. 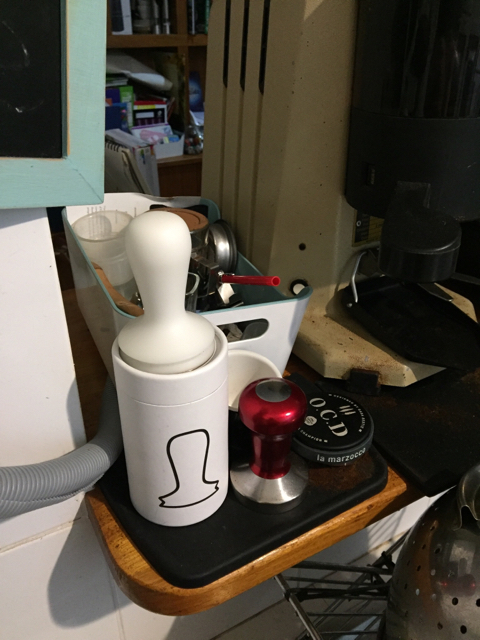 The perger tamper does fit my baskets nicely and tighter than my 58.0mm cafelat tamper, but I probably should have ordered the 58.3mm cafelat tamper. 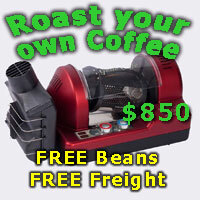 I am running standard Faema and an EP precision triple baskets. Overall it's a good tamper and good value at pre-order pricing. Hello AlastairMcG do the EP precision triple basket fit the standard Faema portafilter on the Carisma S1? I bought a triple basket (generic 21-24 gram from Di Bartoli) but it is a fraction to high for my portafilter as it does not lock into my Carisma very well. Would you or anyone know a naked portafilter brand that fits the Carisma? Would cost less to get the EP basket if it fits.Thanks in advance. The triple EP basket lip doesn't quite sit down on the Faema portafilter edge and therefore, does not lock in as far and probably not as securely. I use the triple EP basket on my naked portafilter, which is the cafelat E61 portafilter. The cafelat one is great quality and has the option of connecting spouts to it as well to operate as a normal spouted portafilter or a naked portafilter. The cafelat portafilter locks into the group head further than the Faema protafilter. 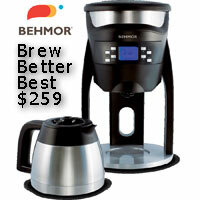 It sits at about 4 o'clock (slightly unideal), where the Faema one sits about 6:30 o'clock. If needed I'm sure a slightly thicker sized grouphead seal would make the cafelat portafilter lock in closer to 6 o'clock. Thanks for the reply Alastair. I discovered With a 58 mm portafilter to have correctly fitting basket it is important to know the lip O.D. on the basket. There are 68 mm and 70 mm lip outside(edge) diameter for what is commonly referred to as 58 mm baskets and corresponding portafilters. I have the issue you described on my Faema portafilters. I have two Cimbali/faema machines and my Faema E98 s1 baskets are not interchangeable with the faema Carisma s1 baskets, the E98 has a basket o.d. 68 mm and the Carisma basket o.d. is .70 mm. Problem is only some sellers give that measurement. just got one a week ago and tested it beside my brother's pullman and he had to admit he was a little peeved i paid so little compared to his and felt it produced a nicer puck! my only criticism would be that the alignment between the acetate and base is a tinge off. but gets to you when it fits the vst so snug. makes me wonder why it wasnt designed so that the acetate doesnt cover all of the metal base, leaves less room for error.